Don't Miss the Pinnell Dance Centre Open Houses! Thursday, September 1st 6:00-8:00 pm. Special Offer: 1/2 off registration fee. Register now! Classes start September 6th. From 18 month to adults, Pinnell Dance Centre offers fun-filled classes in ballet, tap, jazz, hip hop, lyrical, contemporary, tumbling and cheer! 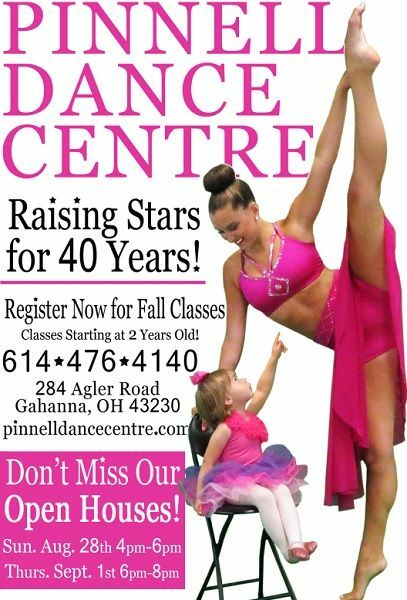 Pinnell Dance Centre celebrates “41 years of excellence” this season. Over the years, the Dance Centre has become nationally known as one of the top schools in the country. Dance Spirit Magazine voted Pinnell Dance Centre one of the top 50 schools in the nation! Students come to this outstanding studio for a multitude of reasons. Many students enjoy dancing as a recreational opportunity to build skills and improve self confidence while having fun and creating a healthy body. Others are serious dancers who find a well rounded program that creates the “total dancer” that can pursue a professional career if so desired. Pinnell Dance Centre has produced students who have performed on Broadway and in tours of Cats, Beauty and the Beast, Million Dollar Quartet, Will Rogers Follies, 42nd Street, Jesus Christ Super Star, Joseph and the Amazing Technicolor Dreamcoat, The Music of Andrew Lloyd Weber, Requiem Variations, West Side Story, etc. Students have also danced with the Radio City Rockettes in New York and Los Angeles, as well as in music videos with Beyonce, Madonna, JayZ, etc, on Glee, on cruise ships and at theme parks including: Disney World, Disney World Tokyo, Opryland, Busch Gardens, Kings Island, Great Escape New York, King’s Dominion, etc. The Pinnell Dance Centre facility was created and built solely for dance. The classrooms have special marley and wood flooring designed to minimize impact on a dancer’s body. The seven classrooms allow different sizes and levels of classes. They are lined with ballet barres and all have viewing windows. Pinnell Dance Centre has been used throughout the years by professional companies such as: The Moscow Ballet, Disney, Paramount, Star Search, Cruise Ships, etc. Teachers at Pinnell Dance Centre are enthusiastic, encouraging and supportive toward their students. They provide a positive and fun atmosphere while teaching great technique. They range from teachers who have graduated from major dance universities to those who have performed professionally. Pinnell Dance Centre often brings in guest artists such as Travis Wall, Martha Nichols, Lauren Adams, Chris Jarocz and many other amazing teachers from around the country to work with the students. The common goal at Pinnell is to create happy, well-trained dancers.